The phone doesn't currently alert the user when the battery is critical. This leads to power loss at times and the user doesn't know it's about to happen or had happened. e.g. during a call, or while listening to music. Also if the phone is sat on the desk unplugged from power connection. <https://wiki.ubuntu.com/Power#Warnings>: "When the device’s battery/batteries are discharging and reach — or begin discharging and already have — 1 hour or less remaining (PC) or 20% or less remaining (phone/tablet), a notification bubble should appear ... When the device’s battery/batteries are discharging and reach — or begin discharging and already have — 30 minutes or less remaining (PC) or 10% or less remaining (phone/tablet), an alert should appear..."
Assigning mpt for Design guidance on how to notify the user of low battery situations, such as when and how to notify users. The spec currently mentions "Be warned of low battery" by "bubble notification, alert" on both the PC and Phone. Coincidentally, I just started designing this on Friday. <https://wiki.ubuntu.com/Power?action=diff&rev2=63&rev1=61> It's not quite done; the notification bubble should have an icon on Touch just as it does on the PC. Would be nice to provide this, just hit the update button prior to an emergency shutdown on the nexus. The design says warn at 20% on phone, that seems quite high since it should be as long as a days use remaining. I'll insert my usual misgiving here about non-indicator-related notifications being provided by indicator code. We should have low-power notifications regardless of whether indicator-power is running or even exists. So, the good news is that the code to pop up a notification is there and working -- an alert does appear, as per the spec. The bad news is that it's an interactive notification, which means that unity-notifications hardcodes the notification to disappear after five seconds. So unless you're looking at the screen during those five seconds, you won't see the notification. I'm not sure how to proceed on this. MacSlow's got a valid point about avoiding feature creep in unity-notifications, but I don't see any other obvious medium for this notification. I'm not sure what the Right Thing to do is here. Perhaps we should have a "low power" sound play, just as laptops and android phones do? FWIW, this bug is compounded by the power icon not showing red at low power levels. This has a fix about to land in <https://bugs.launchpad.net/ubuntu/+source/indicator-power/+bug/1186181>, which has a fix about to land. 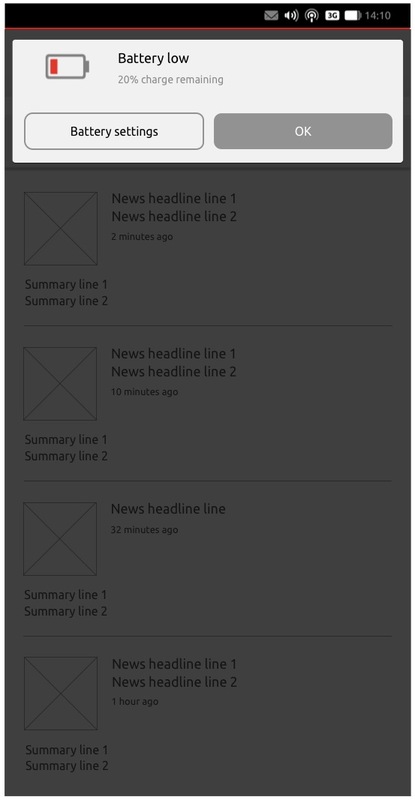 Daniela's updated the notifications spec to handle this case; see attached wireframe. In short, we change the notification to a Snap Decision so that the notification doesn't disappear after 5 sec. The Snap Decision's two actions are "Battery settings" and "OK".